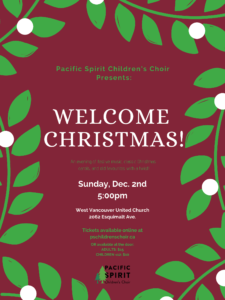 Join the Pacific Spirit Children’s Choir’s annual Christmas Carolong for a festive evening of music to get you in the holiday spirit! We’ll be singing all of the best, from classic carols to old favourites with a twist! After the concert, please join us for a reception in the church hall to meet the artists, and enjoy some refreshments and socialization. 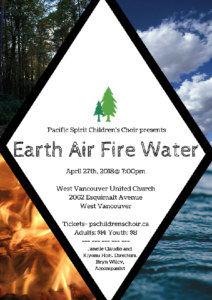 Join the Pacific Spirit Children’s Choir for an exciting evening of music, representing all of the elements through song. Our selection of uplifting and moving music will be sure to have you inspired to get outside and enjoy the best season in Vancouver – Spring!